Travel on horseback with pack animals to carry the baggage is the purest form of the riding tour. You aren’t even depending on vehicles to move your luggage. There is something appealing about the complete independence one has from the civilized world when traveling with pack animals in a wilderness area. One of the most attractive aspects of a pack trip for horse lovers is that you are living with your equine companion 24 hours a day. This was how the first Europeans moved through the Rocky Mountain area and it is how our ancestors used to travel in Europe and Asia since the dawn of recorded history. 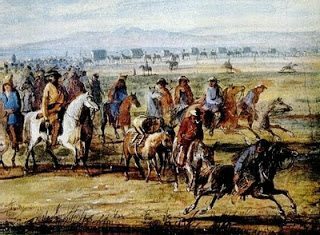 Wheeled vehicles did not cross the Continental Divide until 1827 when they first made a wagon track across South Pass to supply the mountain men in their famous rendezvous beside Bear Lake in Utah. Before that pack horses had to be used. Today there are vast wilderness areas in the Rockies, the southwest and the Andes, where pack trips are still popular and necessary to visit these remote places comfortably. Our Wyoming ranch borders the Yellowstone Ecosystem which is the largest area still protected from development left in the lower 48 states. It is still the kingdom of wild animals and one often sees deer, elk, moose and bighorn sheep. At night you can sometimes hear the electrifying howl of wolves or the higher pitched cry of coyotes. You traverse passes high above timberline and descend into valleys following small streams which eventually make their way thousands of miles later to the Gulf of Mexico. The Grand Canyon Winter Pastures Ride is a unique pack trip which descends on steep trails deep into the Grand Canyon from the rarely visited north rim. As you drop down off the rim you are well sheltered from the cold winds above and you enter a much warmer micro climate which is pleasant even in winter. Crossing the Andes between Argentina and Chile also takes you over vertiginous passes where you can sometimes see the mighty Andean condor with a wing span of ten feet swooping low over the peaks. Loading pack animals for wilderness travel is an ancient art and it is vital that this be done properly for the success of a trip. You will learn to appreciate the strength and endurance of the pack horses as they carry your food and equipment over the steep mountain trails. You can read about packing horses in the heart-warming story of SERGEANT RECKLESS and the classical book by Joe Back, HORSES, HITCHES AND ROCKY TRAILS, often considered the packers bible. One thing you can count on is that pack trips in the wilderness will always be an adventure and unexpected things are sure to happen. For more on the pack trip experience, please read our description here.